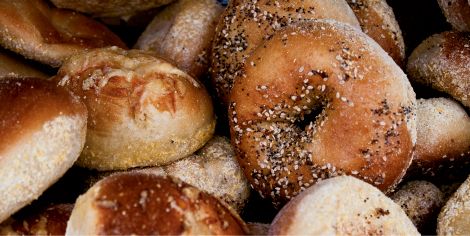 Dense and chewy on the inside with a crisp crust, bagels are satisfying and filling. But the varieties baked by Home Free Bagels and sold at coffee shops and grocers around Asheville offer a more fulfilling reason to indulge. Practicing what it describes as “compassionate capitalism,” Home Free Bagels sells organic, artisan-quality bagels made by once-homeless people who have transitioned into stable housing. Founded in 2011, the company has employed eight formerly homeless folks. Every week, owner Michael Akers and his sole full-time employee, Brad Devitt, hand-roll, boil, and bake about 1,000 bagels at the Blue Ridge Food Ventures shared-use kitchen in Candler. Devitt credits his Home Free experience with helping him enroll in Green Opportunities’ Kitchen Ready program, a local initiative that lifts people out of poverty by training them in the culinary arts. Akers purchased Home Free Bagels last summer and recently diversified the operation by launching a line of organic cream cheeses, including a sweet Nutella-flavored rendition and a spicy, cranberry-habanero mix.